Helios Quality DKS (Kannan-Clinton-Heartbreaker) and Kasalla DKS (Cassini-Lansing-Cor de la Bryère) Selected For Elite FENCES Auction! For the second year in a row, Dejan Krunic Sporthorses is excited to announce that our horses will be appearing in the Elite FENCES auction at the end of August 2017. The premier French auction begins August 29, 2017 with a different auction each night until September 3, 2017. Last year, Nina Simone DKS (Kannan-Cento-Carreras) sold at this same auction. This year, Dejan Krunic Sporthorses had two foals selected for the auction: Helios Quality DKS (Kannan-Clinton-Heartbreaker) and Kasalla DKS (Cassini-Lansing-Cor de la Bryère). Both foals are spectacular looking. Kasalla DKS is Casall out of Beauté de la Vie DKS (Cassini-Lansing-Cor de la Bryère) and was the first filly born of the 2017 season. She's looked great from the start. We're particularly interested in the blood and reflexes that Cor de la Bryère should provide her with. Combined with the enormous scope of Casall, as well as his movement and strong backline, it is easy to understand what the FENCES selection committee saw in this filly. Helios Quality DKS is Kannan out of Bella Vita van de Molendreef (Clinton-Heartbreaker-Beach Boy) and he's going to be tough to part with. (In fact, we're going to have to tie Dejan down to prevent him from going to the auction to buy this stunning colt back from himself!) Helios Quality DKS is the product of out collaboration with Koen Terryn of Quality Stud. When naming a horse after a Greek god, you have to think twice. What if this one is a dud? Of course, with a dam who is full sister to Beezie Madden's Coral Reef Via Volo, named 2011 Horse of the Year in America, it was hard not to have high hopes for him. To boot, his full brother, Nic-Nac Quality, is an approved stallion with Zangersheide. From what we've seen so far, those hopes were not in vain. This is a spectacular looking colt. He's full of power and has excellent conformation and movement. His athleticism is apparent, and he appears to be a very good prospect for future stallion selections. This has been an exciting summer for us and having two foals selected for the Elite FENCES auction is just one of the reasons! 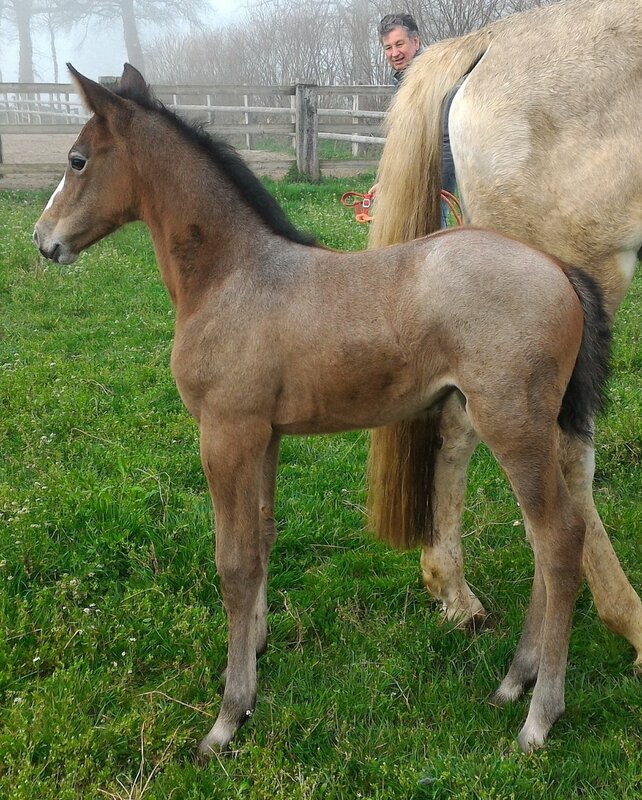 Helios Quality as a newborn foal! Kasalla DKS as a newbord foal! Newer PostEKANO DKS (Kannan-Kumana by Cumano) Approved by Selle-Français Studbook! Older PostEkano DKS Excels at Selle Français Stallion Qualification in St. Lo!